My Journey to Fit: FMM - Presents, Pups, and Plants! 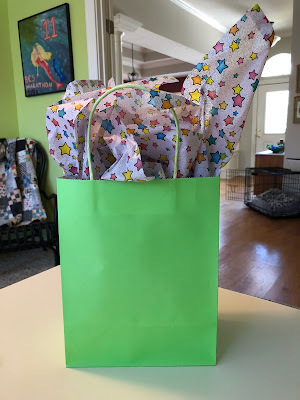 FMM - Presents, Pups, and Plants! Yarn is Adriafil Knitcol, colorway is Verdi Fancy, with a brim of Cascade 220, colorway Sapphire Heather, which was leftover from a previous hat and ended up matching the main yarn perfectly, despite being from a completely different company! Pattern is Basic Baby Hat. I offered to find an outfit that went with the hat, which Allie gratefully accepted, and this is what I came up with. 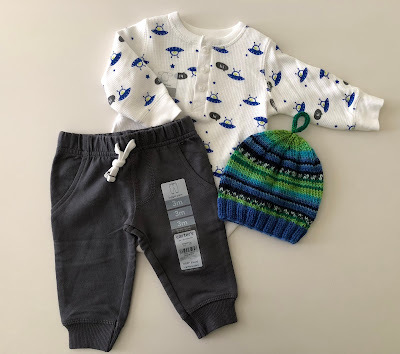 Cary helped me shop; she loves these bodysuit onesies and little soft jogger pants for Logan, so I figured this would be a good choice. I'm a full-service mother - even bagged up the gift and sent it along with Jeff when he went to Dallas so he could bring it to Allie. Best part about knitting this hat was having a baby to try it on for size; Logan is growing out of his hats so quickly that I wanted to make sure this would fit the new baby for a few months, at least. Lucky for Logan, his mama is knitting him some sweet hats so he's covered - haha, literally! But what is remarkable is that Paco stayed on the bed while I took a shower. 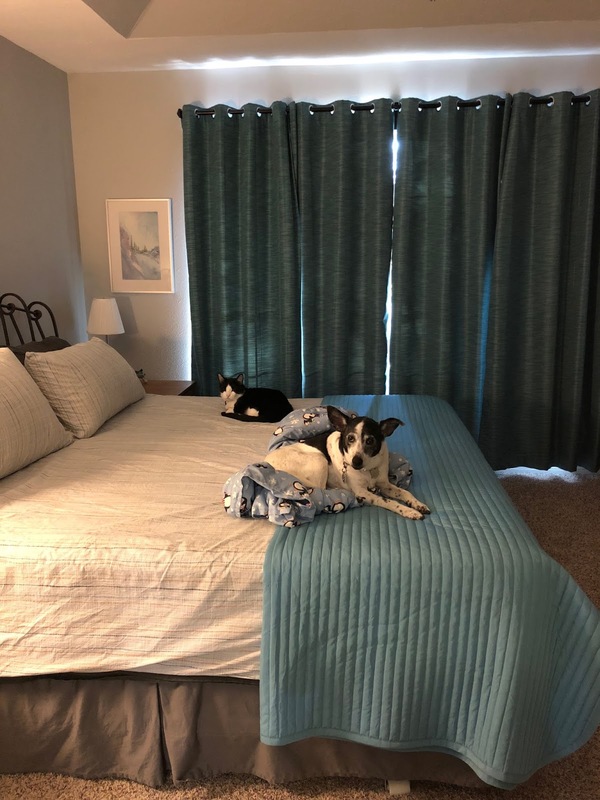 We've had him for nearly 11 years, and every time I go to take a shower, he jumps off his nice warm spot on the bed and "hides" behind the closed bedroom door, because he's afraid he's going to have to get a bath. Every time. And yet when it's actually bath time for Paco? We remove his collar and he walks into the shower fairly willingly. But he always hides when he's not even close to having a bath - until one morning last week. I was so surprised to see him that I had to take a picture and send it to Jeff. He's back to hiding again - this was a one time deal, I guess. I hope these New Yorkers can adjust to becoming Texans! I've always admired her hostas whenever she shows pictures of them, so she very kindly mailed some to me; they are a shade-loving plant, and while I have a few shady areas around the side of our house, I wanted to see these guys, so we planted them in a pot that is mostly in the shade on the patio. Fingers crossed we keep them alive! We have a special themed run on tap for tomorrow - I'll tell you more about it on the next WWU. Have a great weekend! Cocoa always hangs out on my bed when I shower. The funny part is the hair dryer--she loves when I blow it on her, shows her teeth, and goes crazy! LOL. Heidi usually hangs out in the hallway right outside of the bathroom door whenever I take a shower. We've never given her a bath at home so she's not afraid; but she IS clingy so has to be right where one of us is at all times. Was it the day of the cold front when Paco stayed on the bed? Maybe comfort overruled safety?? And hostas. I cannot keep them alive. I even bought a "foolproof" one this spring. dead. I'm guessing I either over or under water them. 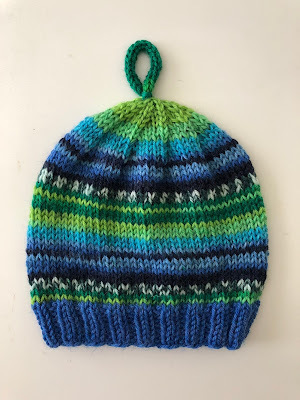 I'd love to see pictures of the hats you make for your nephews when you're finished! Haha, Baylee always has to bust right right in the bathroom when she hears the shower running. I think she's hoping that it's bath time for her! That's a great baby outfit and hat. When you said you made one for the new dad does that mean you made matching father son hats? That is the cutest hat. I want a grandchild so I can have an excuse to knit baby things. 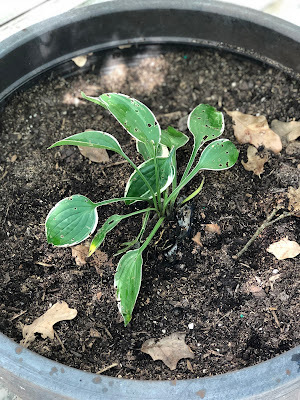 Here's to baby hostas! If they go dormant when it gets cold, they will probably do well. The baby hat is precious!! Love that outfit too! Too funny about your doggie. Mine hides when she hears the word "bath"!